A dog at a southern Indiana shelter has quickly become an internet star. The video features a dog named Napoleon, who adorably takes issue with being unable to sit on his foster mom’s lap. The clip lasts about 40 seconds as Napoleon expresses his cute displeasure. Workers at Southern Indiana Animal Rescue aren’t sure what breed Napoleon is but believe he may be a corgi mix. His stubby appearance leads his veterinarian to believe he may have a form of dwarfism. He has an enlarged esophagus and can’t swallow like a normal dog (a condition called megaesophagus). As a result, he has to eat gruel-like mush from an elevated bowl. Otherwise, food could become lodged in his esophagus and he could choke. Napoleon isn’t up for adoption right now. His foster mom is making sure he doesn’t eat any type of dry dog food or get any treats or human food that could pose a choking risk. The video has been viewed more than 3.9 million times since being posted. 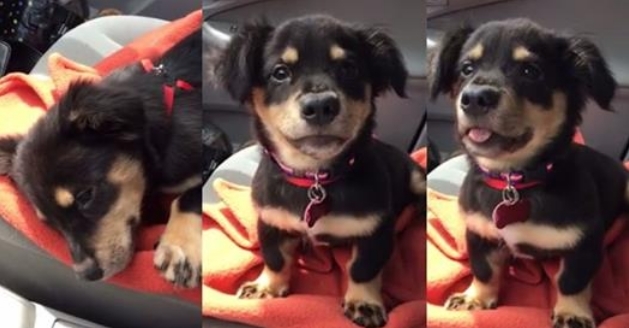 Responses to "Rescued Puppy Throws Cutest Temper Tantrum When Not Allowed on Foster Mom’s Lap"
My pek makes the same squeeky sounds too,they grow out of the lap dog neccessity after time with a real owner and solid dog food in his system. A real owner should try em out!